Did you remember about my review of Bourjois Rouge Edition Velvet here?. 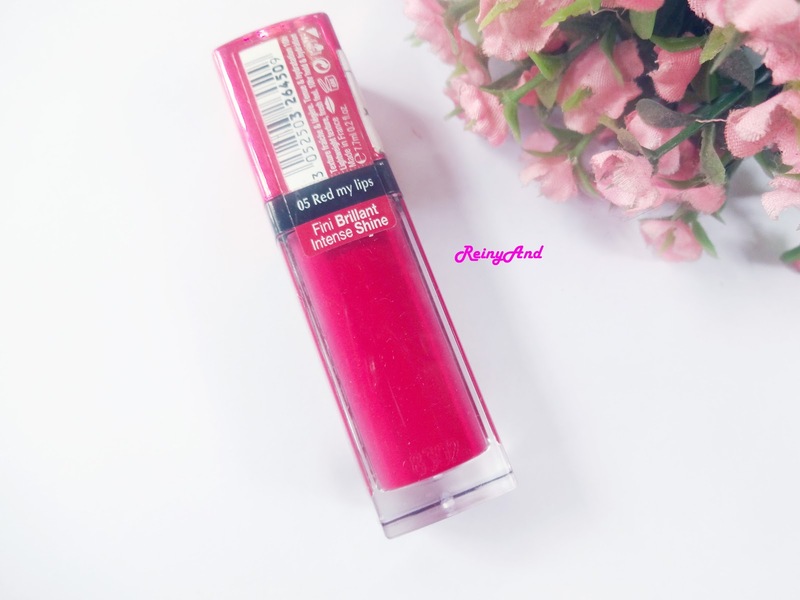 As you know that Bourjois matte lip cream so fenomenal and really hard to find at Indonesia Drugstores because ya it sold very fast, maybe so many fans of matte lip cream from Bourjois. 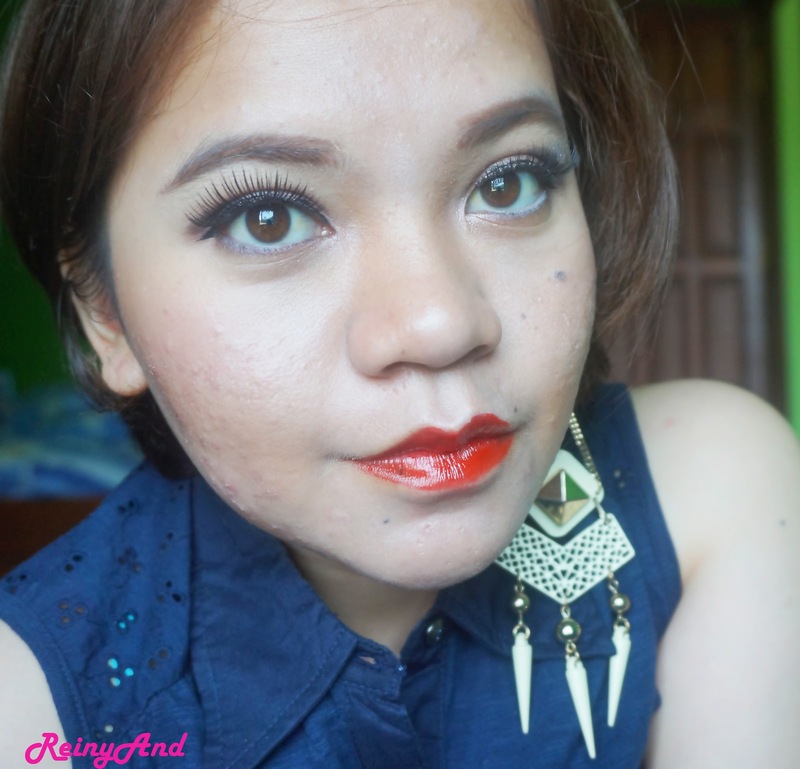 At the End of August, Bourjois Indonesia had launched new lip gloss and let me Introduce you about new lips product from Bourjois. Packaging: it’s exactly same about the body packaging of this lip gloss like the velvet one; there is a lil bit different in the cap packaging. The Aqua Laque has a shiny color and looks more luxury. On the bottom still you can see the code of the color and the side of the body you also can see the name and the code of this product. 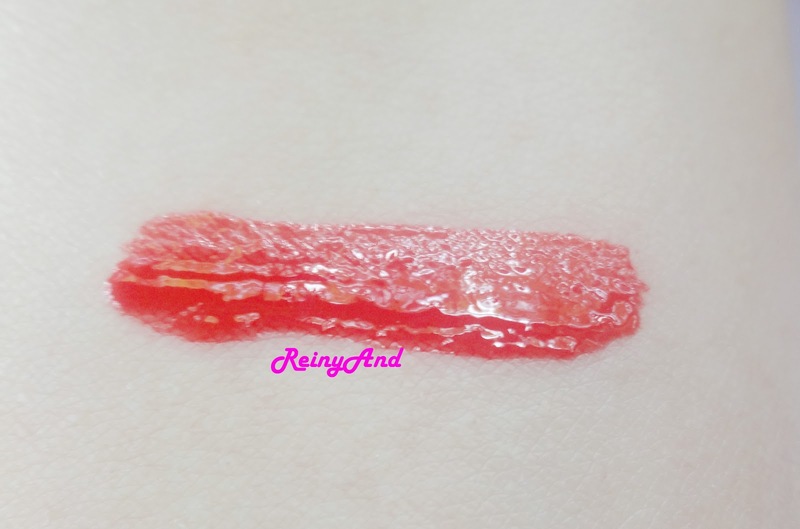 Kemasannya mirip dengan lip cream edisi velvet, tapi di bagian cap kemasannya gak sedikit berbeda karena yang edisi aqua laque ini mempunyai warna cap yang lebih shiny juga terlihat lebih mewah. Di bagian bawah kemasan tetap sama kamu bisa lihat kode dari warna nya dan di bagian sisi kemasan juga kamu bisa lihat nama dan kode produk. 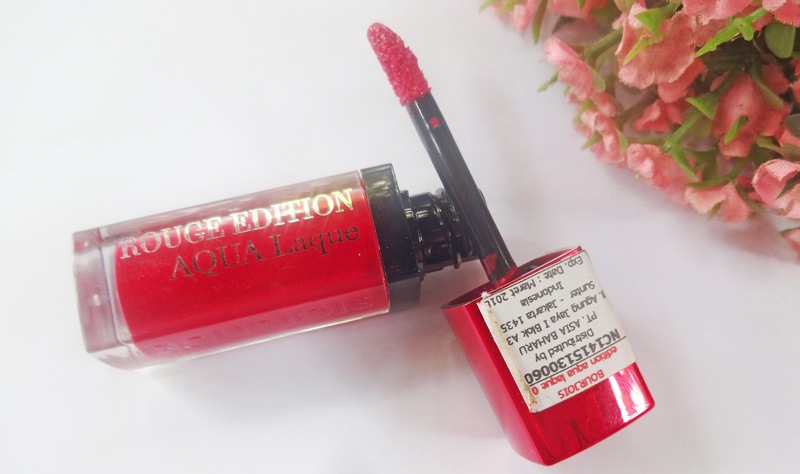 Applicator: Ah I can’t say more about the applicator too, because as you can see that the applicator same as previous rouge edition velvet right? The applicator is smooth and really help you to glides this lip gloss on your lips with perfectly and properly. 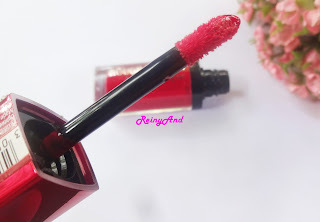 Aplikator nya juga sama dengan yang edisi velvet, aplikator nya lembut dan benar-benar membantu untuk mengaplikasikan lip gloss nya dengan sempurna dan benar. 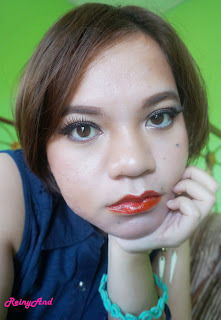 I got no.5 shade and the name is red is my lips, it’s really a nice bright red color with hint orange. Ah I really like the color because it’s so intense. Talk about the scent, hmmm it’s nice and fresh. Saya dapat shade no.5 dan namanya adalah ‘red my lips’, warna merahnya terang dengan hint oren. Ah pokok nya saya suka banget deh warnanya yang intens. Eh giman wangi nya? Hmmm enak kok soft dan fresh gak ganggu deh. 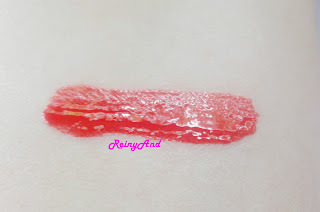 Swatch: I just need 1 swipe to get the intense and vivid color, it’s pigmented enough. Since the claims contains of 45% water, so the product has glossy finish. The texture is like gel, but not too watery and not heavy then. Saya Cuma butuh 1x oles untuk mendapatkan warna yang intens, cukup pigmented. Karena klaimnya mengandung 45% air maka produk ini hasil akhirnya glossy. Tekstur nya mirip-mirip gel tapi gak cair banget juga gak berat pas di aplikasikan. When am using this lip gloss, I didn’t feel any greasy or heavy on my lips. It’s really bright my lips and my lips look sexier with the red color, my lips become moist, juicy and it leaves stain btw. Since this lip gloss is not matte finish, it’s not stay for long hours if you eat and drink with hardly but still it leaves stain like lip tint. 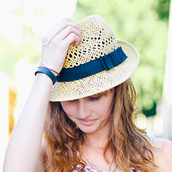 There is a fresh and calm sensation when the lip gloss glides on my lips. Ketika saya menggunakan lip gloss ini, saya gak merasa bibir jadi berminyak atau berat lho terasa ringan dan enak banget di bibir. Warna nya benar-benar bikin bibir terang dan terlihat lebih seksi dengan merahnya :P , bibir jadi terasa lembab, dan meninggalkan stain. Karena ini adalah lip gloss jadi bukan matte finish ya…jadi untuk ketahanannya gak begitu lama kalau kamu makan dan minum yang berat atau beringasan haha tapi tetep ningglin stain kaya lip tint gitu kok. Ada sensasi fresh dan kalem saat mengaplikasikan produk ini di bibir. 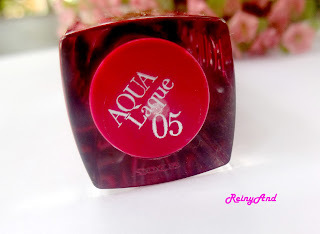 Where to buy : Bourjois Counter at Metro,Sogo or Drugstores like guardian.